Machine Learning (ML) models are very useful to predict physicochemical properties of small organic molecules, proteins, proteomes, and complex systems. These methods may be useful to reduce the cost of research in terms of materials resources, time, and laboratory animal sacrifice. Recently different authors have reported Perturbation Theory (PT) methods combined with ML to obtain PTML (PT + ML) models. They have applied PTML models to the study of different biological systems and in technology as well. 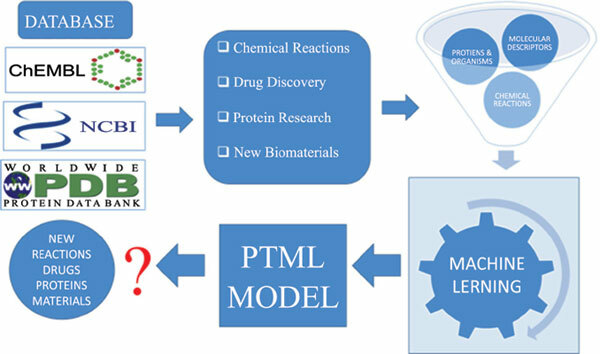 Here, we present one state-of- the-art review about the different applications of PTML models in Organic Synthesis, Medicinal Chemistry, Protein Research, and Technology. In this work, we also embrace an overview of regulatory issues for acceptance and validation of both: the Cheminformatics models, and the characterization of new Biomaterials. This is a main question in order to make scientific result self for humans and environment. Perturbation theory, Machine Learning, Organic synthesis, Carbolithiations, Drug Discovery, Protein Targets, New Materials, OECD, REACH, Regulatory issues.